The achievements of successful local schoolchildren were celebrated earlier this month at a special awards ceremony at St Mary’s Stadium in Southampton. Pupils from The Hamble School secured a range of prizes, with those from Years 7, 8, 9 and 10 eligible for the awards. Local estate agents Leaders, which operates branches in Hedge End, Sarisbury Green, Southampton, Eastleigh and Ocean Village, is the main sponsor of the school and branch manager Karen Arkell was on hand to present Ryan Cook with the Outstanding Leader award. She says: “This is a wonderful event that allows some of the school’s top performers to be recognised in the way they deserve and we are delighted to be able to take part. “I was honoured to meet Ryan, who has shown maturity, motivation and ability in equal measure over the last year. I was very happy to be able to present him with his award for superb leadership and excellent communication. 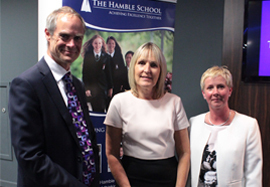 Karen joined head teacher Lisa Croak and guest speaker Jonathan Prest, who is the principal of Barton Peverill College. For more information or advice on the property market contact your local Leaders branch.